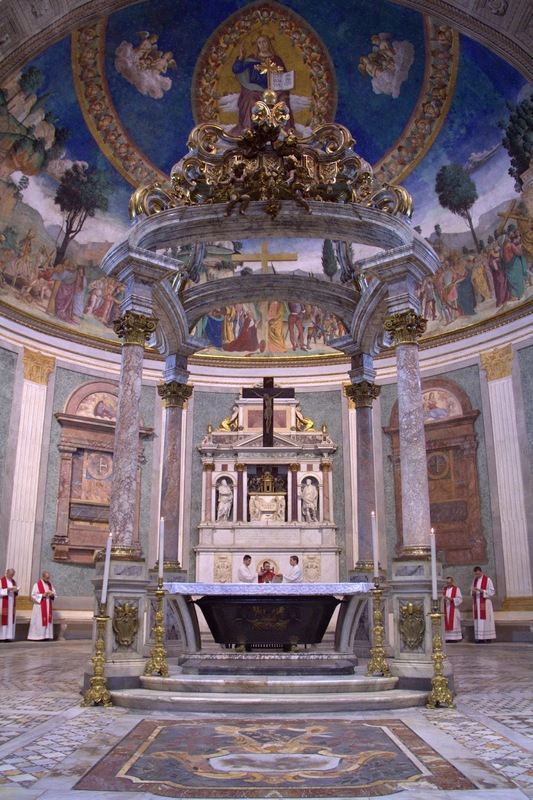 This past Friday, a solemn Mass in the Mozarabic Rite was celebrated in the Roman Basilica of the Holy Cross ‘in Jerusalem’ (Santa Croce in Gerusalemme), by Fr Salvador Aguilera Lopez, a priest of the archdiocese of Toledo. The Mass of the Finding of the Holy Cross was said, celebrated mostly in Latin; the Mozarabic chants were sung by members of the Pontifical Institute for Sacred Music, directed by Prof. Franz Prassl. The chant edition used was the Cantoral Mozárabe of Card. 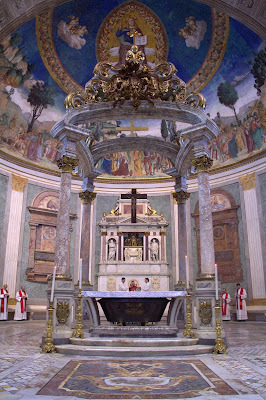 Cisneros, published in early 16th century, when the Cardinal was making every effort to preserve the Mozarabic Rite; it was he who established the Mozarabic chapel in the Cathedral of Toledo which has maintained the traditions of the rite to this day. Four videos of the chants of this Mass will be published later this week. My thanks to Mr Marc Williams for coming to take these photographs so we could share them with our readers. 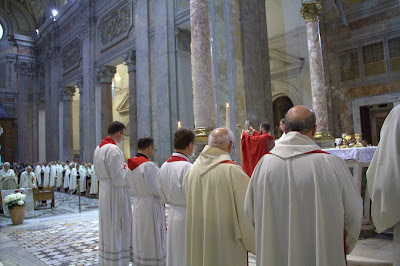 I have noted some of the interesting features of the Rite in the caption; you can click on the photos to enlarge them. The seat for the celebrant in set up in this church under the tomb of Francisco de Quiñones, who was its Cardinal from 1528 until his death in 1540. He was the author of the famous “breviary” variously known as the Breviary of the Holy Cross, after his cardinalitial title, or Quiñones Breviary. A concelebrant prepares the chalice at the Offertory; note the use of the so-called scruple spoon. After the Offertory, since there are a number of other prayers to be said before the Preface, the vessels with are covered with a veil. Before the giving of the peace among the clergy, the priest says a prayer called ad Pacem, then extends his hands over the people and says, “May the grace of God, the Father almighty, the peace and love of Our Lord, Jesus Christ, and the fellowship of the Holy Spirit always be with you all.”; the choir answers, “And with men of good will.” These words are closely modeled on the last verse of Second Corinthians; the Mozarabic Liturgy has a number of interesting points in common with the Byzantine Rite, in which that same verse is said during the Preface Dialogue. 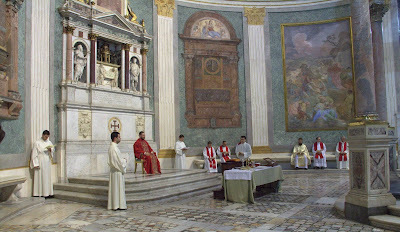 After the Lord’s Prayer and the Embolism, the priest shows the paten and chalice to the people and says “Sancta sanctis - holy things for the holy,” which is also said in the Byzantine Rite before Communion. The Mozarabic Mass has a very interesting Fraction ritual; nine particles are laid on the paten, the first seven in the form of a Cross, the last two at its right. 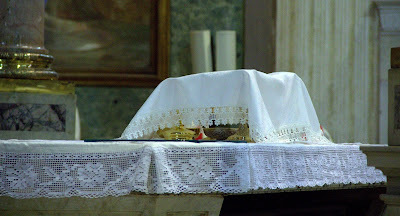 as the priest names them from the mysteries of Christ’s life: “Incarnation, Birth, Circumcision, Apparition (at the Baptism), Passion, Death, Resurrection, Glory, Kingdom.” After “Sancta sanctis”, the particle named “Kingdom” is dropped in the chalice.